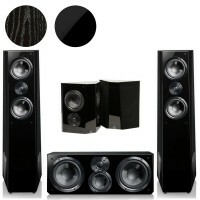 Sherwood Teatro Black 5.1 Channel Home Theatre Speaker System delivers a true in home cinema-like experience. The efficient five speaker system is complemented by a 10″ subwoofer to reproduce the full audio range, true to life imaging and bass. The Prime Series speaker pack represents the perfect combination of advanced acoustic engineering, high end design elements and exquisite sound quality for stunning home theatre performance at a head turning price. Choose from five and seven pack options. The Ultra surround sound system delivers jaw-droppingly immersive audio performance that will transport you into the heat of movie action, or on-stage with your favourite musicians. 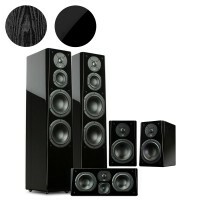 The Ultra series of speakers feature the finest materials and the most advanced SVS technologies. Pairing SVS's Prime Satellite speakers with their acclaimed SB-1000 sub, this system delivers a complete experience. With the precision to hit every note and bring out every word, the cinematic dynamics to bring scenes to life, and a compact size to work in any room.